Slow Down Music Trainer, a mobile phone app that lets you slow down music with out changing pitch! A music player for musicians, singers, dancers, choreographers, and students. It lets you really hear all the nuances. Slow Down Music Player makes it easy to learn new songs by slowing down or speeding up play back without changing the pitch! The song will sound the same as the original just faster or slower. You can use the phrase editor to isolate the tricky parts of a song like the solo or a cool lick, and loop that section over and over again. 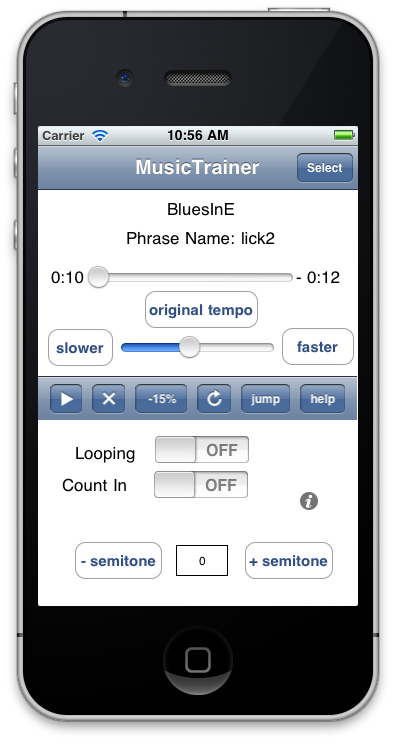 Use it to slow down a song to work out a tricky solo, hear the lyrics, or work on a transcription. Use it to choreograph a dance routine. Makes a great vocal trainer. Use the speed up feature it to review lecture notes, pod casts or audio books stored in your iPod Music Library Works with guitar, bass, trumpet, piano, voice, or any other instrument or audio file. Whether you are a professional or a student this is a must have tool! Buy it now on iTunes only $3.99! Seamless integration with your devices built in iPod Music player, Apple Music, and Spotify Premium allows you to access your entire music library! 8/08/2017 uploaded version 4.0.1. You should be able to this update as soon as it is approved by apple. This version allows you to access your Spotify Premium account. Wow... I'm endorsing Music Trainer! This is a great application. I have bought computer programs and special guitar trainers in the past. They where had to use and expensive. It's quite amazing what it does for just a couple of bucks, considering you can pay several hundred bucks for a Tascam slow downer device. Those products do a lot of other functions, too, but the fundamental and most desirable feature is the ability to slow the songs down significantly without introducing noise artifacts. I am the Director of jazz studies at a Western Illinois University and am very excited about this wonderful application for the iPhone/Touch! It works easily and as advertised. The ability to slow down audio without changing the pitch is invaluable for students who are trying to transcribe jazz solos. This program delivers just that. I've communicated with the developer and made some suggestions that will make it into the updates making this a magnificent tool for transcription. When the developer incorporates the planned phrase editor, there won't be enough stars to describe how great this application is, especially for the price. The phrase editor would allow any chunk of audio to be defined so that users can select just a solo or part of a solo. I can't wait to see this app develop. Finally a powerful and useful practice tool for all serious students of music!!!! If you're a musician trying to learn tunes, this is a must have! Works perfect. I down loaded this, followed the directions, and it immediately worked. Sound is fantastic, and even has an option to speed tunes up! Highly recommended for any person trying to learn tunes.